I can't believe I did it again! Yes, folks, I read Book Four in a series and didn't realize it until the end. If you like this review, I suggest you read the other three books before this one. 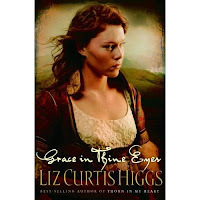 Grace in Thine Eyes is my first Liz Curtis Higgs' novel. Wow! Now I know why she's such a popular author. Liz lifted me from my bed and transplanted me to the Isle of Arran where most of the action takes place. By the end of the book, she had replaced my Bronx accent with a Scottish one. Her main character, Davina McKie, walks through this story like a shining beacon. In spite of severe setbacks, she presses on and never gives up on life. She's far from flawless, but acknowledges her weaknesses and gives grace to those around her. Liz left nothing to chance. She visited Scotland and did extensive research. I doubt if the most fastidious history buff could find fault with her tale. I give this book a big cheer. Hey Liz, I'll be reading more. I can't lose that new Scottish accent. Thanks for the "heads up" on this book. I will be going to the book store this weekend and check it out! Always looking for recommendations on Christian books! Although I haven't read the other books in the series, I suggest you start with them. It's frustrating for me to discover I could have read a whole series from an author. I've done it enough times. You'd think I'd learn my lesson. Good review. I've always been interested in Scotland. Hopefully I'll get around to visiting the country, but until then, I'll settle for reading about it. LOL You have a bronx accent? :-) Hehee. I've actually read the first and second book in the series but stopped because I couldn't bear either of the heroine's not getting their HEA. But since this is a different character, I'll have to check it out. This is a historical book, so I'm sure Scotland has changed quite a bit. :) The descriptions of the setting are excellent. Did you notice the cover? They did a great job. I did notice the cover and I agree, it looks great! Liz Curtis Higgs is one of the best Christian historical authors today. I admire her style and energy. I agree with your assessment. Her writing is excellent. Liz and I communicated the other day. She informed me that Grace in Thine Eyes was designed as a stand-alone, second-generation novel. The other three books were also supposed to be singles, but the stories just kept coming. The picture here doesn't do the cover justice. A lot of the detail escapes the eye. If you get an opportunity, take a look at it in the bookstore. This was also the first book of fiction that I read by Liz Curtis Higgs. It was also my first ever historical fiction. I thought I would start with the stand-alone book, in case it didny 'grab' me. But I was hooked from the beginning! I then read the trilogy, and loved them all. Can't wait for her new book, to be released a year from now. 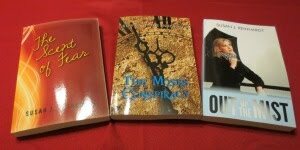 The books in the trilogy must be read in order:- Thorn In My Heart, Fair Is The Rose and Whence Came A Prince. For those interested in present-day Scotland, Liz has written an armchair travel book, "My Heart's In The Lowlands". In is a ten day journey in Bonny Scotland, covering many of the places mentioned in the trilogy. Wonderful!! Through Liz's writing, you feel that you are right beside her on the journey, just the two of you. An absolute delight! Welcome to my blog. I post here on Monday, Wednesday, and Friday. Thank you for your helpful comments. I enjoyed this book very much, but was concerned I'd missed out on the series. Liz set me straight, saying this title was a second generation, stand-alone novel. I'll be looking for more of her books in the future.